One of the main reasons for having a screen door is, of course, so you can let the fresh air in without letting bugs in along with it. And it’s very natural to focus on the door itself when making sure it's effective in keeping those annoying and potentially dangerous intruders outside where they belong. In order to keep bugs out of the house, you want to make sure that your screen is in tiptop shape. But there’s another less obvious factor that’s just as important: making sure you have a high quality screen door weather strip. Unfortunately, most screen doors on the market have no seal at all. And that’s a significant failing that will leave you dissatisfied…and maybe living in a house with a bunch of bugs. That’s because it’s virtually impossible that a door without weather stripping will form enough of a seal against the frame to stop bugs from getting inside. And, over time, the repeated banging of door against frame – besides being loud and annoying – will create gaps big enough for them to sneak through. Having a screen door without weather stripping is a lot like locking your door against burglars but not bothering to shut your windows. But not all screen door weather stripping options are equal. And, some won’t effectively seal your entryway against bugs or stand up well to everyday wear and tear. For example, one of the most commonly used screen door sealing options is V strip, also known as tension seal. It’s a plastic or metal strip folded into a 'V' shape that springs open to fill gaps. The problem is that, after repeated use, V strip starts to lose elasticity, bend out of shape, and crack or rot in spots. And, of course, these results of ordinary everyday use will make your home vulnerable to bugs. 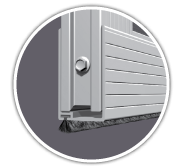 Another of the commonly used door weather seals, rubber and vinyl weather stripping, becomes dry, brittle, and cracked over time. And, like V strip, rubber and vinyl has a tendency to lose its original shape. Finally, self-adhesive foam tape stops sticking over time, causing it to pull away from your frame or fall off completely. And, like V strip, foam tape will also eventually start to lose its elasticity. Out of all available screen door weather stripping types, the best door weather stripping to use is wool pile weather strip. It’s composed of small woven strands of wool, the same kind that are used in the most durable woolen carpets. Commercial grade wool pile has a structural integrity and consistency that will last the entire life of the door. This assures a long-lasting tight seal against bugs. And it won’t peel, crack, or lose its shape over time. It also creates a “quiet close,” preventing that annoying slamming sound that can be as hard on the structural integrity of your door as it is on your ears. 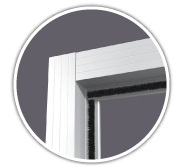 That’s why, at PCA, all of our screen doors come with a high quality wool pile seal all around their perimeter, ensuring complete and long-lasting bug protection. This is a significant advantage over most doors that only have a bug sweep along the floor. And, as a bonus, that your door always closes both gently and quietly.